HomeAcademiaFeaturesMelting potFrom Man Utd at £1bn to Wigan at £43m: what’s your club REALLY worth? From Man Utd at £1bn to Wigan at £43m: what’s your club REALLY worth? 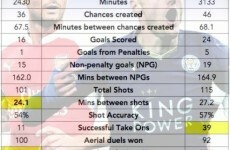 Recent months have seen some extraordinary numbers bandied around for the values of English Premier League clubs. Arsenal were rumoured to be the target of £1.5bn offer by a Middle Eastern consortium, who have gone strangely quiet since. In January, Forbes said Manchester United had become the world’s highest value ‘sports franchise’ worth $3.3bn (£2.1bn). But on what consistent and rigorous basis are these claims made? TOM MARKHAM, a qualified accountant and former foreign exchange trader with an MBA in Football Industries from the University of Liverpool, has collaborated on projects with national associations, clubs, agencies and sports consultancies. About to complete a PhD in Football Finance at Henley Business School’s ICMA Centre, here he outlines exclusive new research that reveals a new reliable valuation model, universally applicable to Premier League clubs. Manchester United are the only football club in Britain worth more than £1bn, I can tell you that. And by ‘worth’ I mean using a fixed set of financial criteria, hard economic data, to look at what they make and what they spend to come up with a ‘rational’ value for the club. Rational: what somebody would pay for a thing if they arrived on earth with no preconceptions about glamour or otherwise, status for its own sake, what others have said before. In a moment, in great detail, I’ll explain how my new valuation model works, and provide a link where you can read in greater depth precisely how this model stands up to scrutiny. But I can also tell you that West Bromwich Albion are currently more valuable than Everton, and that Tottenham are worth more than both Manchester City, the Premier League title-holders, and Liverpool, the 18-times champions of England. Between 2005 and 2010, twelve Premier League clubs changed hands. Currently, eleven of the division’s 20 clubs are controlled by foreign owners. Despite the dramatic increase in club acquisitions in recent years, it has become apparent that finance professionals within the football industry use vastly differing methods to ascertain a club’s value. This is illustrated in the example below of Tottenham Hotspur, which was listed on London’s Alternative Investment Market (AIM) until January 2012. These estimates above make you consider, which figure, if any, is correct? A potential investor’s judgment will unquestionably be impaired by the significant discrepancy of £267.5m between the highest and lowest club valuations outlined above. This was the underlying motivation for this research which analyses what methodologies are applicable to football club valuation. The full research paper – which you can download free by clicking here – introduces the Markham Multivariate Model (MMM) developed specifically to value Premier League clubs. Prior to developing the model, six established valuation methods were assessed for their accuracy in estimating an EPL club’s worth. Of these models, three were general company valuation techniques: Market Capitalisation, Discounted Cash Flow (DCF) and Bankruptcy Value. Three were contemporary football industry valuation models: Revenue Multiples, Forbes ‘Most Valuable Soccer Teams’ and Broker Values. For comparison purposes the models were calculated for a period of nine seasons between 2003-04 and 2011-12. 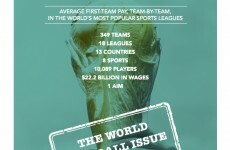 This coincides with the first publication of Forbes ‘Most Valuable Soccer Teams’ in 2004. A valuation model needs to be reliable and universally applicable to all Premier League clubs to be considered as the optimal method to value a club. This straight away causes a problem for the Market Capitalisation method as only two of the current twenty EPL clubs are listed (Arsenal) or partially listed (Manchester United) on an exchange. This means that Market Capitalisation cannot be universally used to compare club valuations. It also proves somewhat erratic for club valuations from the evidence in Table 1 (pages 19 & 20 of the full paper, downloadable free). For example, Tottenham Hotspur’s 2012 market capitalisation of £83.6m (highlighted above) seems extremely undervalued especially given that midfielder Luka Modrić was sold by the club for £33.3m alone six months after this valuation. Spurs are regularly profitable, owns their stadium and training ground in London and have a strong squad of players including the coveted Gareth Bale. At the other end of the spectrum, Manchester United was valued at £1.49bn in 2012 which is £100m more than any other method calculated the club’s worth to be. This illustrates that the method cannot be universally adapted or relied upon to value clubs. DCF is recognised to be the most dependable means of valuing a regular company. The shortcomings from football perspective are that it requires regular profitability and accurate predictions of future revenues to provide reliable valuations. The majority of Premier League clubs are not profitable and cannot predict future financial performance due the volatility of a team’s on-field performance. Nevertheless, it was possible to calculate the value of 53 of the 73 clubs under review in Table 1 (pages 19 & 20 of full paper). The results using DCF to calculate club values are mixed. There are examples of overvalued clubs in almost every season including: Tottenham Hotspur at £684.m in 2011-12, Manchester United at £1.4bn in 2010-11 and Tottenham Hotspur at £1bn in 2009-10. There are also examples of distinct undervaluation including: Tottenham Hotspur at £7.4m, Manchester City at £8.1m in 2004-05 and Chelsea at £95.9m in 2003-04. It is therefore evident that DCF is neither consistently reliable nor universally applicable to valuing clubs in the Premier League. Table 1 (in pages 19 & 20 of paper) also contains the club values attributed to the Revenue Multiples valuation method. This is the first technique under review that can be used to calculate the value of all clubs between 2003-04 and 2011-12, but is it reliable? The answer is no. Although revenue multiples is recommended by academics and professionals in the sporting domain, the truth is that the methodology is far too simplistic. The results show that it tends to work adequately to provide a quick estimate for EPL clubs with lower revenues but provides large undervaluation for the more established clubs with higher revenues. Manchester United was sold for £800m in 2005 but the revenue multiple for the club in that year was £253.6m. This undervalues the club by over 68% and this is consistent for larger clubs such as Manchester United, Arsenal, Liverpool and Tottenham Hotspur throughout the nine seasons under review. The method also fails to take into account what assets a club has under its control, its debt position, is it controlling costs and its profitability. It is therefore evident that Revenue Multiples can be universally applied to value clubs in the EPL but its results are not consistently reliable. The bankruptcy and broker values were not estimated as the financial distress of a club or sentiment of the owners cannot be realistically simulated and differs on a case by case basis. This leaves two methods to examine: Forbes ‘Most Valuable Soccer Teams’ results and the Markham Multivariate Model developed for this research. Forbes have been publishing the 25 highest valued clubs in world football on an annual basis since 2004. These values are based on the magazine’s own valuation methodology which seems to have evolved in recent seasons. Table 1 (pages 19 & 20 of paper) was compiled only to include EPL clubs included in the Forbes lists between 2004 and 2012 as the magazine’s nebulous methodology could not be adopted to value any further EPL clubs. This means that the Forbes method was not universally applied to EPL valuations for the purpose of this research. At first glance at the Forbes results in Table 1 (pages 19 & 20 of paper) seem more credible than any of the previous methods examined. This probably explains why it has been the industry benchmark by default. A comparison of sale transaction prices of North American sports franchises and Forbes valuations found that Forbes values were 27% higher than the actual sale prices. It became obvious over the course of this research that none of the aforementioned valuation methods were universally applicable and capable of providing a reliable value for every EPL club. Consequently, it was decided to develop an alternative valuation technique capable of achieving these underlying objectives – the MMM. After scrutinising all the established valuation models and the niche requirements of the football industry, the components of this model were finalised. The model includes a club’s: revenue, profit (or loss), net assets (all the clubs assets less all its liabilities – including debt) as well as football industry key performance indicators: stadium utilisation per cent and wages to revenue per cent. The model is explained in detail within Section 5 of the paper available here. The table below compares the actual transaction values of Premier League clubs (where over 51% of the club was sold) to Forbes valuations and the MMM between the 2003/04 and 2011/12 seasons under review. Although there are only Forbes values available for seven of the fifteen transactions that took place during the sample period, it is evident that their results are even less reliable than those previously highlighted relating to North American sports franchises. The table above shows that Forbes estimates were between 59.2% lower (Manchester City in 2008) and 69.1% higher (Liverpool in 2010) than actual transaction prices. Looking specifically at Manchester City which changed hands in 2007 and 2008, Forbes valued the club 51.8% higher than cost in 2007 and 59.2% lower than cost in 2008. The fact that only two clubs were valued within 10% of the actual transaction cost by Forbes illustrates that their method is not reliable or universally applicable to EPL clubs. This leaves the MMM as the last methodology to be considered. The model uses audited accounting data and industry KPIs to provide a bespoke valuation method designed for the football industry. Leeds United entered a period of financial distress between 2003 and 2005. 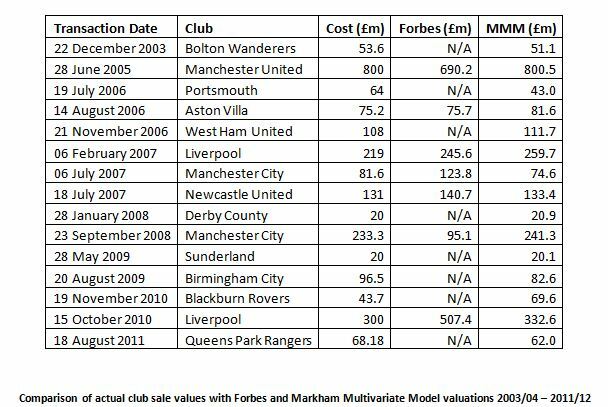 Table 1 (pages 19 & 20 of paper) shows that the multivariate model disclosed the club was almost worthless and in need of re-capitalisation whilst Forbes failed to recognise this along with the other valuation models. The table above reveals that on average valuations using the multivariate model were only 2.8% more than actual club transaction prices. The valuations of Manchester United in 2005 and Sunderland in 2009 were exactly correct to the nearest million pounds. The Moores and Walker families who sold Liverpool in 2007 and Blackburn in 2009 respectively acknowledged that they sold at a lower price as they felt they were selling to new custodians who would propel the clubs forward which is evident in the multivariate models higher valuations for both clubs. All this evidence suggests that the MMM is the most reliable valuation model encountered of the course of this research as well as being universally applicable to all EPL clubs. It is only fitting that the multivariate model is used to calculate a Premier League club valuation table: the one at the top. Unsurprisingly, the commercially dominant Manchester United is top with a value of £1,060.4m. Arsenal, the only club to be profitable for every in every season under review, is a close second at £942.9m; thanks mainly to the development of the Emirates stadium. 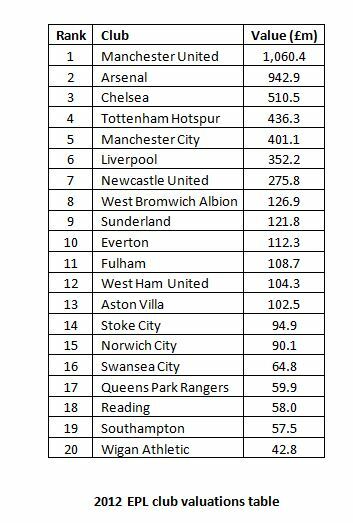 Chelsea with its smaller stadium and higher player wages is third at £510.5m. The consistently profitable Tottenham Hotspur is next with a value of £436.3m. Big spenders, Manchester City come in at £401.1m. This valuation reflects the fact that Manchester City does not own its stadium and paid inflated player transfer fees and wages in recent seasons. English football’s most decorated club, Liverpool, is sixth with a value of £352.2m. This value reflects the fact that Liverpool are earning approximately 40% of what Manchester United and Arsenal make on every match-day. Their value will increase significantly when the club redevelops its Anfield stadium. Newcastle United is next at £275.8m based predominately on the club’s ability to fill St. James’ Park on a constant basis. The prudent West Bromwich Albion is eighth at £126.9m. Sunderland is next with a value of £121.8m would could be improved upon by attracting more fans to the Stadium of Light. In tenth place is Everton at £112.3m. Like city their rivals, a new stadium would significantly increase the value of Everton. Benefactor backed Fulham comes next at £108.7m. West Ham United is twelfth at £104.3m but should be worth significantly more if the club remains in the Premier League and successfully relocates into London’s Olympic Stadium. Subsiding Aston Villa are worth £102.5m according to the model. Now consolidated in the Premier League, Stoke City is next at £94.9m. Norwich City is valued at £90.1m. Strategic Swansea City is sixteenth at £64.8m. Big spending Queen’s Park Rangers are valued at £59.9m. Reading, Southampton and Wigan Athletic make up the bottom three in the multivariate model valuation table at £58m, £57.5m and £42.8m respectively. The MMM introduced in this research provides a universally applicable approach that can be used to value any club in the Premier League. It also provides the most consistent and reliable results of any method examined in this research. It is also flexible and allows club valuations to be amended in line with contingency scenarios which is critical given the unpredictable nature of football (e.g relegation or UEFA Champions League qualification). For an example of the model’s flexibility, let’s take a look at Leeds United. Using figures from its 2012 financial statements, the club is worth £34m according to the MMM. If the MMM figures for Leeds are adjusted in line with projected 2013-14 Premier League revenues and expenditure, the club could be worth £175m if it was promoted to the Premier League. There are a number of potential benefactors from the model. There is only a very limited amount of academic research in the area sports franchise valuation. Consequently, this research will build on the existing literature in this area whilst focusing on football club valuations in particular. Secondly, it is hard to believe that an industry that generated £2.9bn in England in 2010-11 does not a reliable valuation technique to value its core assets – the clubs. A reliable valuation method is of benefit to: buyers, sellers, brokers, finance providers and club administrators. The research conducted could be extended to examine whether the MMM is applicable to value clubs in the English Football League, the Scottish Premier League and Football League, other European league clubs and major North American sports franchises. Clubs, researchers or other interested parties wanting to know more about the model can contact Tom Markham here, and can download his full academic paper here. Tom can be followed on Twitter @TMFootyFinance. The research will also feature in the May issue of FC Business magazine. The performance of football club managers: skill or luck?